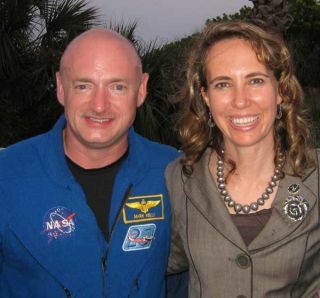 Wounded congresswoman Gabrielle Giffords is recovering rapidly, according to an update today (Feb. 9) from her husband, astronaut Mark Kelly. "It is hard to believe that only one month has passed since Gabrielle was shot," Kelly wrote on Facebook. "The doctors say she is recovering at lightning speed considering her injury but they aren't kidding when they say this is a marathon process. There are encouraging signs everyday though." Giffords is undergoing rehab in Houston after sustaining a bullet wound in her head during a constituent meeting outside a Tucson, Ariz., supermarket Jan 8. The attack killed six and injured 13. Kelly announced only recently that he had decided to resume training for his scheduled launch on the space shuttle Endeavour April 19. Those plans had been put on hold following the shooting (NASA appointed a backup commander to train in Kelly's place), but as of two days ago, he had resumed training full-time. Kelly said his decision was based in part on his wife's amazing progress in recovery. "Gabby's appetite is back and – even though it’s hospital food – she's enjoying three meals a day," he wrote. In fact, she has reached the point where she verbally asked for toast with breakfast this week, the news site Politico reported. Kelly's upcoming shuttle mission will be the last for Endeavour, and the second-to-last for the space shuttle fleet before it is retired by NASA. Kelly's twin brother, Scott Kelly, is also an astronaut and is currently in space commanding the International Space Station.